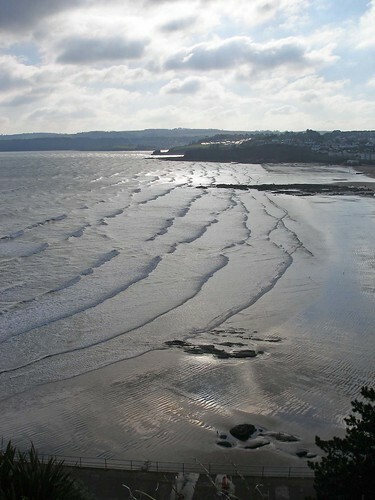 As I drove back from Paignton, the low sun cast long shadows across the sensuous folds of the South Hams hills. But the sunshine was deceptive; the temperature outside was 7oC and in the distance, there stood Dartmoor sprinkled liberally with snow like icing sugar on a cake. It was our first taste of winter and, inspired by Mark Cocker’s recent Guardian Country Diary on “The meaning of a bumblebee”, I had been to Roundham Head in Paignton to see what insects were about on this cold day. There were pockets of warmth in sheltered corners of the Roundham Head Gardens but generally it felt cold in the wind and by the time I got back to the car my hands were numb. 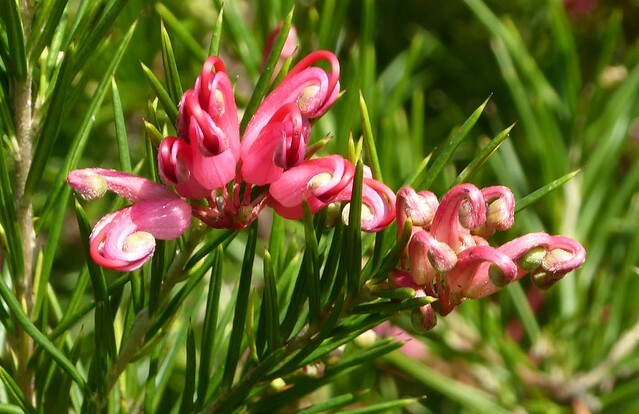 Despite the conditions, there were plenty of flowers about: yellow scorpion vetch in profusion, hanging curtains of rosemary with a few grey-blue flowers, exotic pink and white grevillea, purple spikes of hebe and the pink cup-shaped flowers of bergenia. What about the insects? 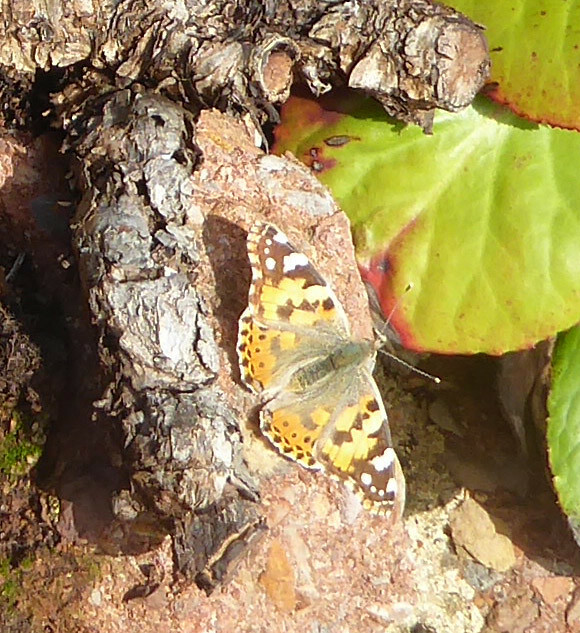 I saw a few large black flies and one hopeful hoverfly but my biggest surprise was two smart looking painted lady butterflies enjoying the sunshine. 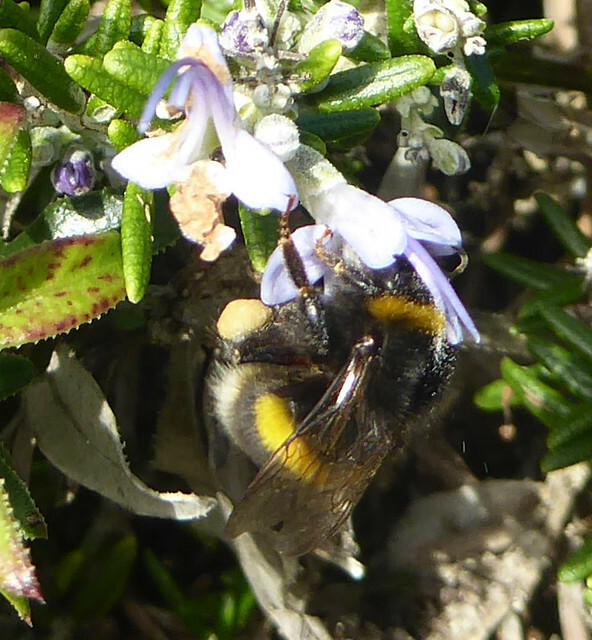 Seeing bumblebees required patience but eventually I was rewarded by the appearance of a few buff-tailed bumblebee workers filling their pollen baskets by probing the rosemary, grevillea and bergenia. 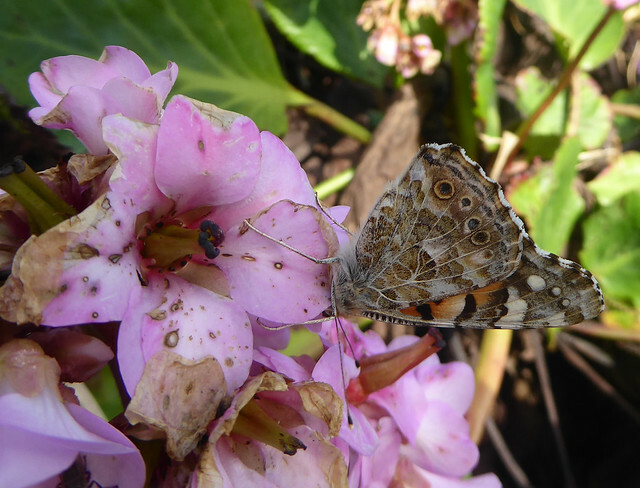 I also saw one plump and furry buff-tailed queen meticulously working the bergenia flowers before she flew off. 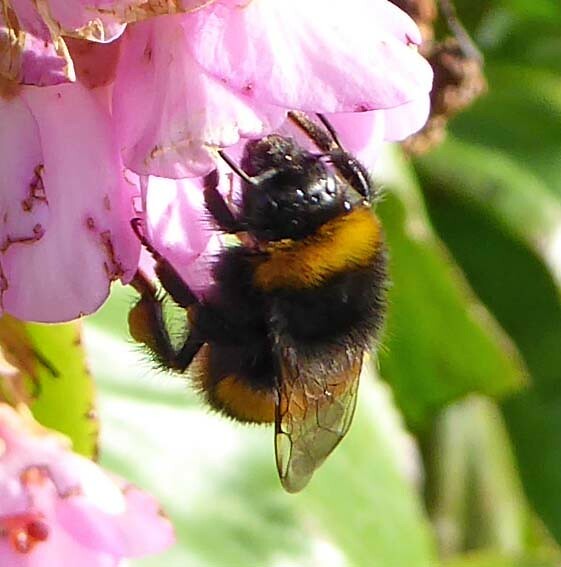 Buff-tailed bumblebee (B.terrestris) worker on bergenia. The pollen baskets are visible. 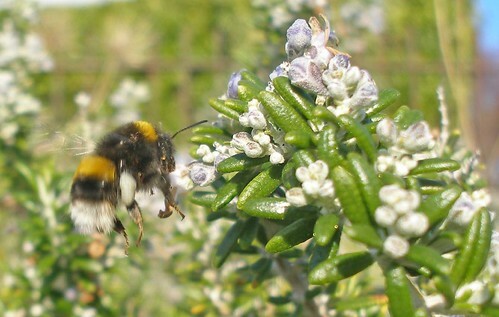 Mark Cocker attributes his surprise sighting of a bumblebee in Norfolk on January 1st to anthropogenic global warming and anomalous weather linked to El Nino but there must also be suitable forage for the bumblebees if they are to be active in winter and survive. 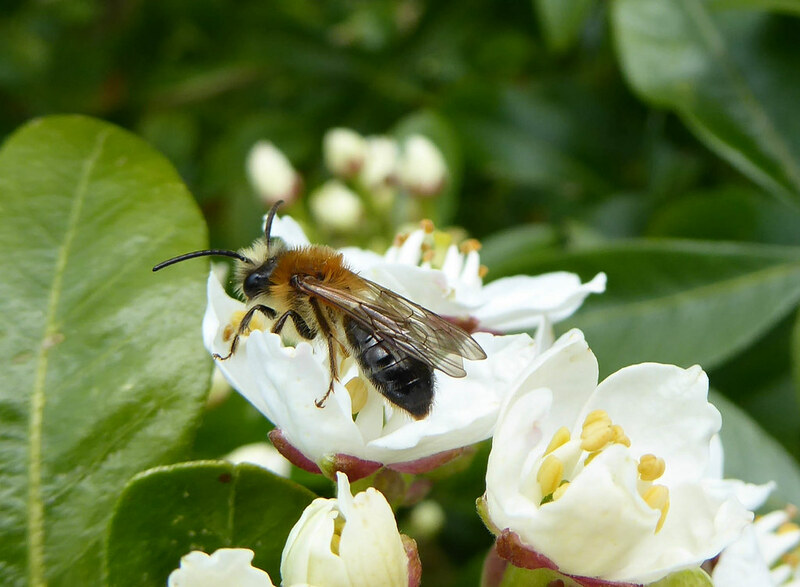 The British penchant for gardening and for planting winter-flowering shrubs seems to supply this forage. 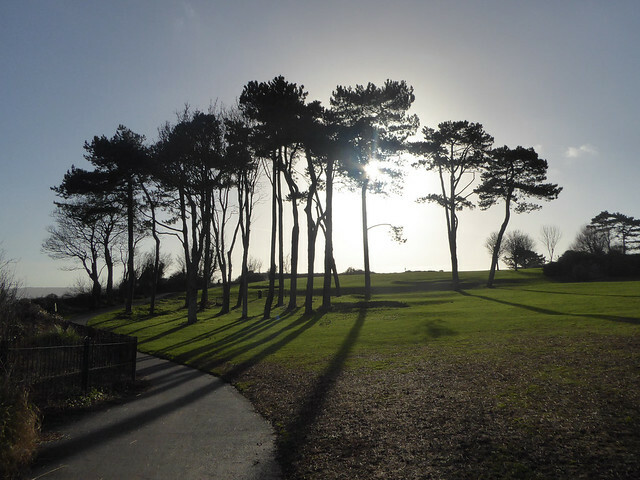 It was a sunny Sunday morning in January last year and we were walking through public gardens at Roundham Head in Paignton, South Devon. 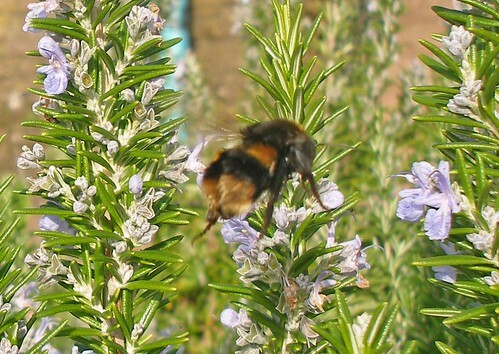 Passing a bank of flowering rosemary, we spotted a bumblebee. Surprising? 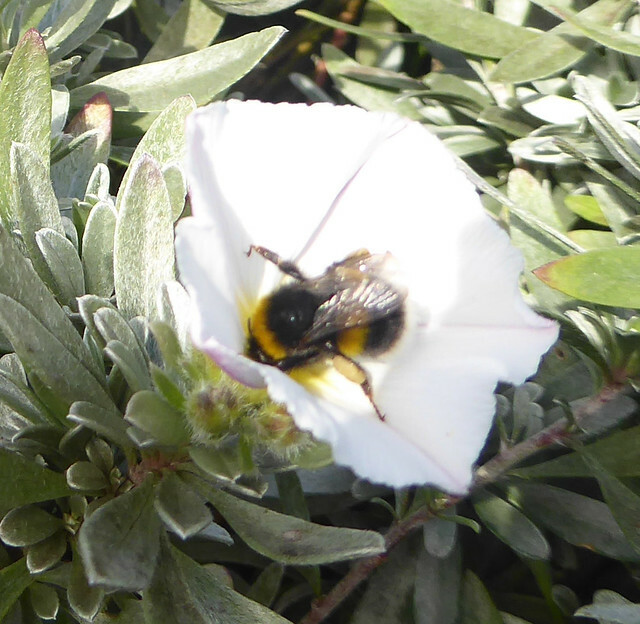 Well yes, bumblebees are supposed to be hibernating in January, aren’t they? Fast forward 12 months to January 2015 and we are passing through these same gardens. 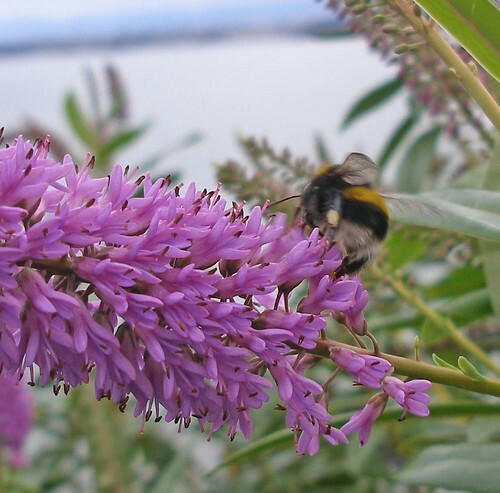 As we enjoy the sunshine we notice another bumblebee, feeding on a very smart looking purple Hebe. This time we take a few photos before the insect flies off and we confirm that it’s a worker bumblebee with loaded pollen baskets. 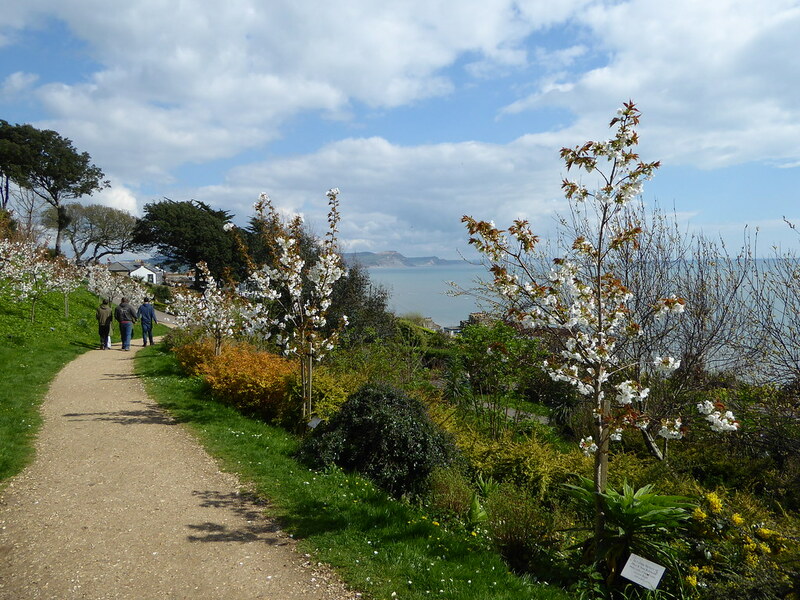 I was very intrigued by these observations and felt compelled to find out more, but first I need to tell you about the gardens as they are a bit special. 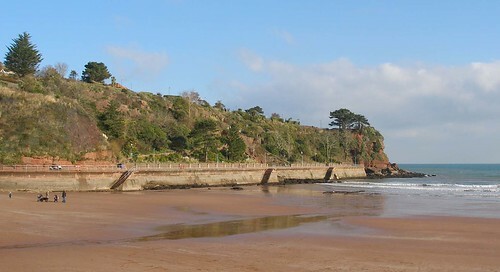 Roundham Head from the southern side showing the Cliff Gardens above the esplanade with the red cliffs on the far right. 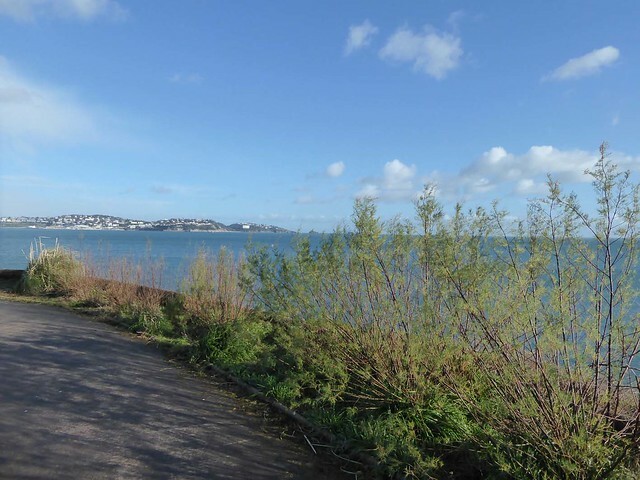 The popular seaside holiday resort of Paignton is enclosed by urban sprawl and Roundham Head is a surprising botanical oasis in this part of South Devon. 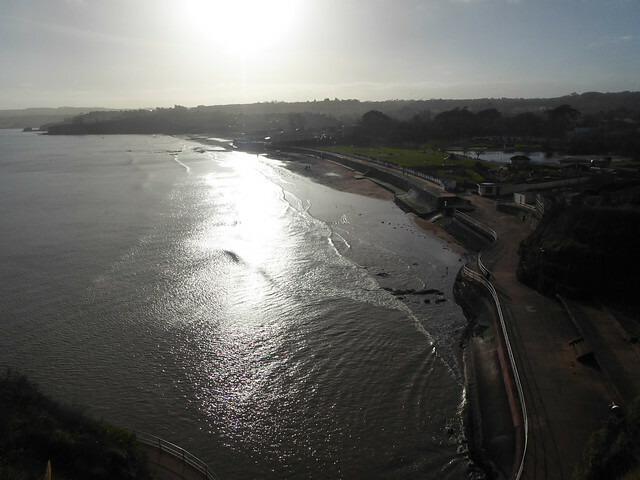 To the North of the headland is Paignton harbour with its many tempting summer treats (wildlife and angling cruises, Molly Malone’s seafood stall and so on), all sadly closed at this time of year. 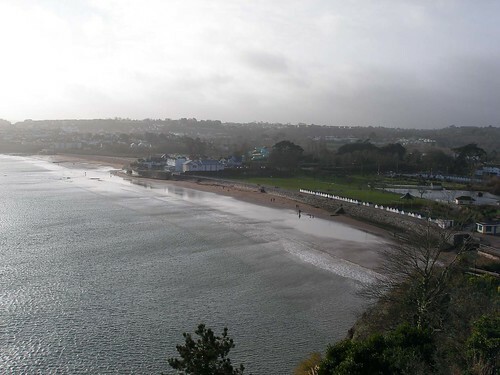 To the South is Goodrington Sands, fine for a pleasant summer’s dip but, in winter, a dog and doggy walker’s paradise. 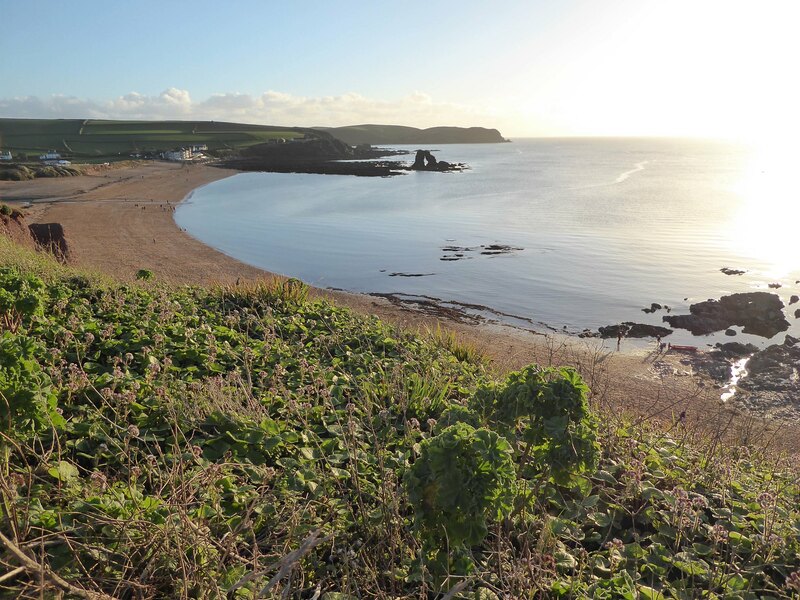 The headland itself is surrounded by steep red cliffs and is grass-topped with a fine stand of pine trees offering Mediterranean views across the Bay to Torquay. 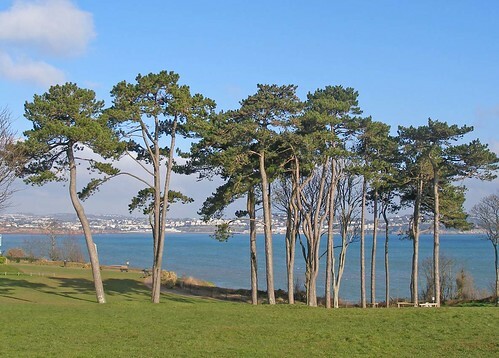 Pine trees at Roundham Head – Mediterranean view? 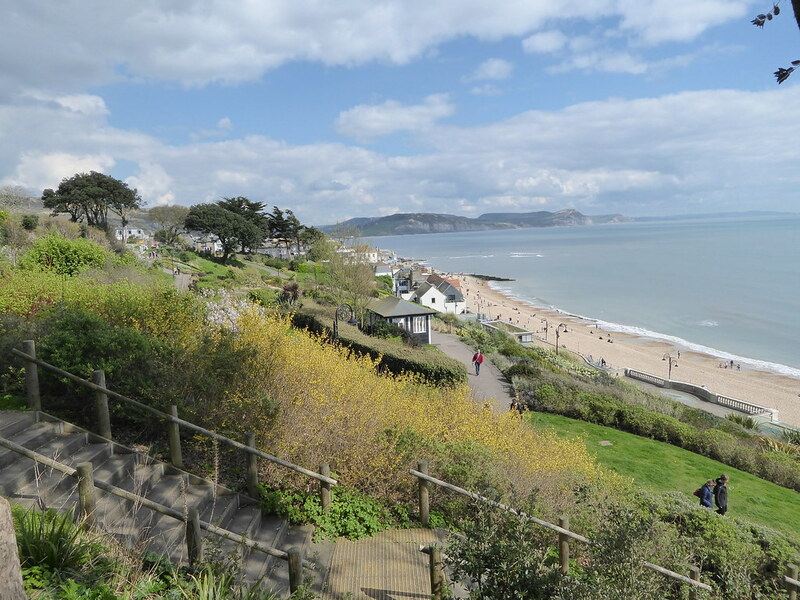 The cliffs on the southern side are where we find the Cliff Gardens (sometimes called Paradise Gardens). 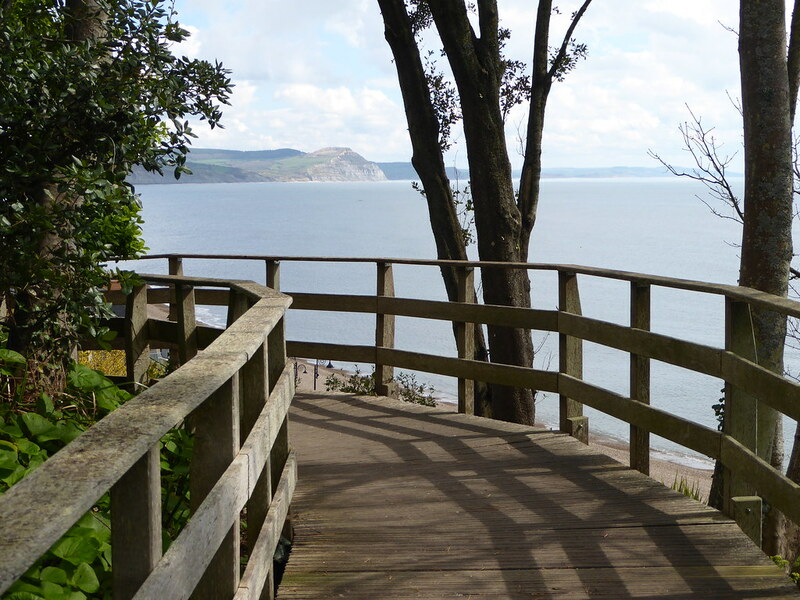 A maze of flower beds and zigzag paths ascend and descend the cliffs and there is an occasional secluded seat for those who wish to contemplate the sea or simply rest. 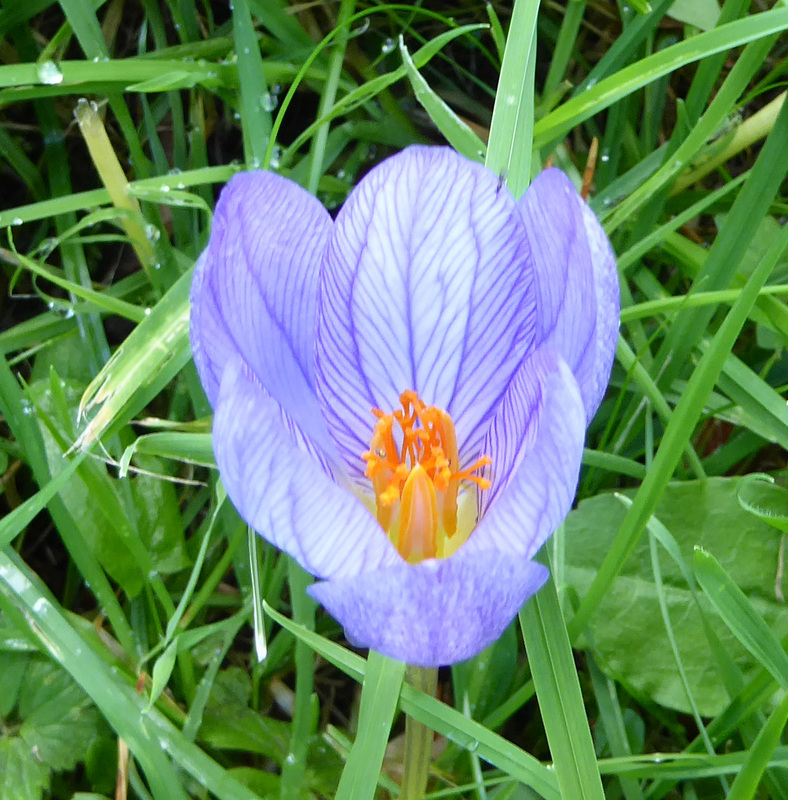 The Gardens themselves seem to enjoy a very mild microclimate. Many of the borders are protected from the wind and for much of the day, the sun, when it is out, warms the soil. 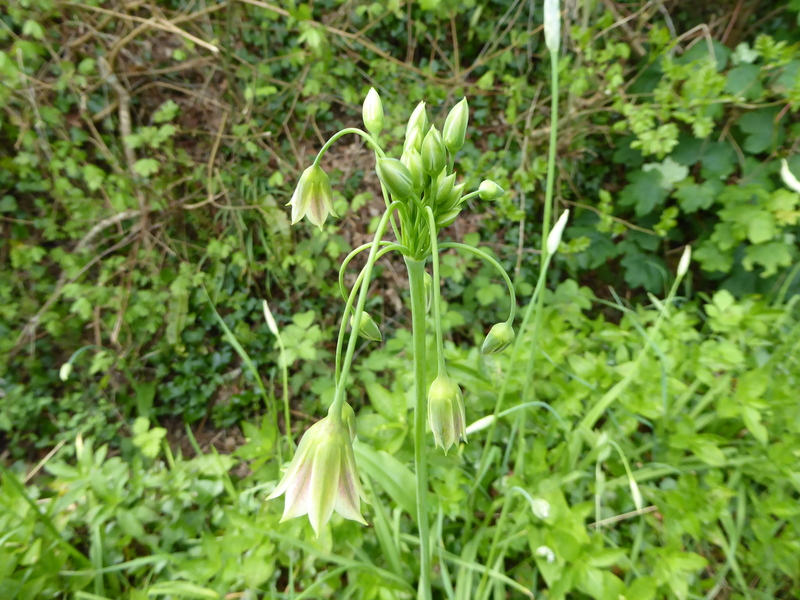 The Gardens are home to tender, sub-tropical plants and there are flowers throughout the year. 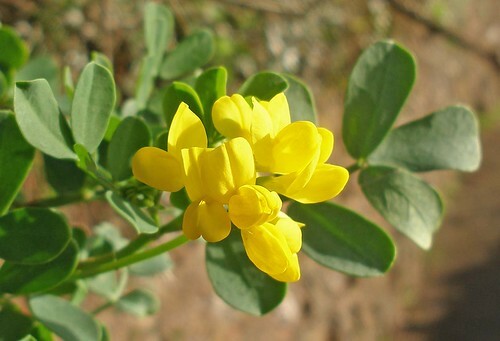 The predominant colour in January is yellow from the scorpion vetch (Coronilla valentina, a native of the Mediterranean ) which thrives here. Five days after the most recent sighting, I am back in the gardens with my camera, looking for bumblebees and getting a few odd looks from passers-by. 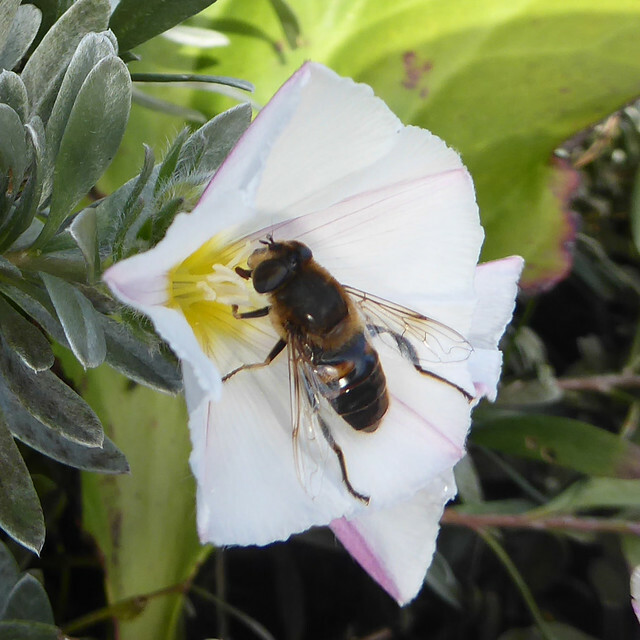 I had scoured the forecasts on the Met Office web site and the weather today was predicted to be sunny and mild (12oC, good for bees), although rather gusty and getting windier (not so good for bees). It is a bit of a gamble but I decide to risk a visit. When I reach the Gardens I take the first path, half left downhill, where there is a huge bank of rosemary facing in to the sunshine, enveloping the border and the wall below. It’s a mass of small blue flowers and I immediately see a worker bumblebee on the blooms, its pollen baskets laden. It’s either a buff-tailed (Bombus terrestris) or white-tailed (Bombus lucorum); the workers of both species look similar. I zigzag up and down the paths and don’t see any others until I come across a large island border just below the top of the cliffs. This is filled with flowering rosemary, some tired-looking bergenia, and more scorpion vetch. 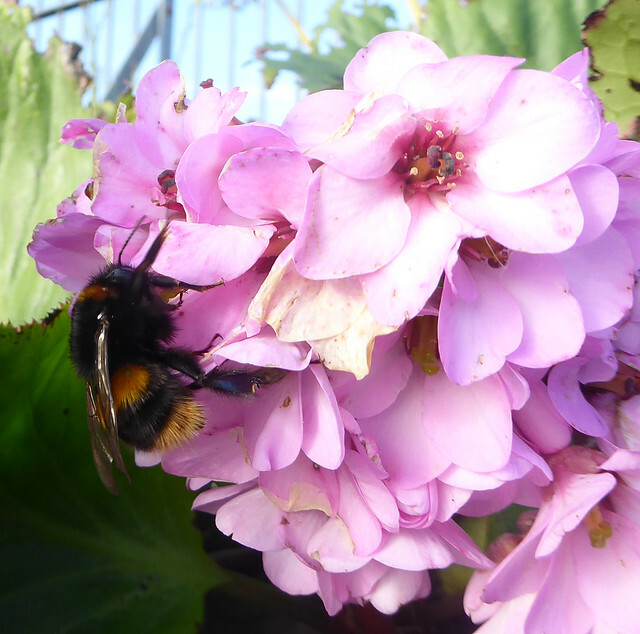 There are two or three queens here, definitely Bombus terrestris based on their buff-tails, feeding from the bergenia and rosemary flowers. They don’t use the vetch. It’s quite gusty but they are very determined and forage despite the wind. I feel sorry for them: one gets blown off a flower stem another seems to shelter for a while but she could be warming up. Eventually I give up as the wind is too strong. Despite the weather, it was worth the visit but I now have many questions. 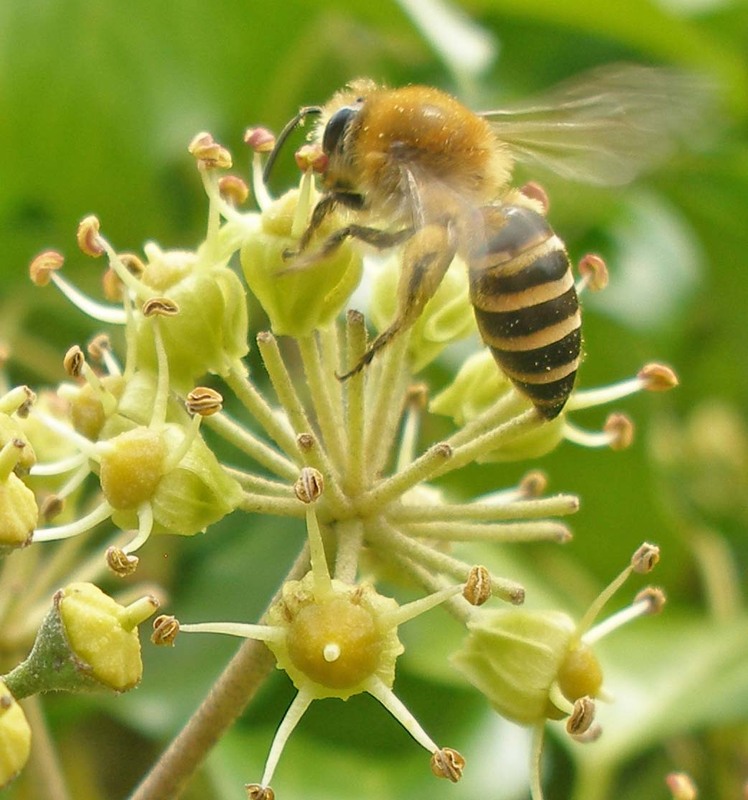 How many bees and how many colonies? 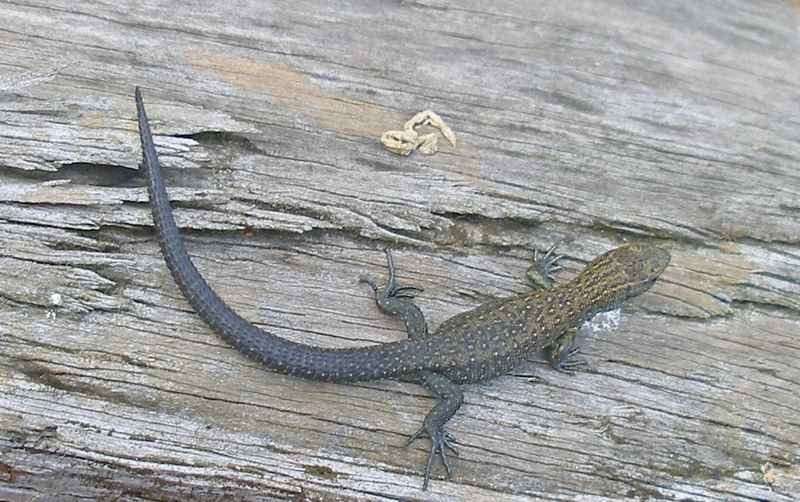 Are they all buff-tailed? Where are the nests? Why is there a mixture of workers and queens? So, two weeks later, the weather again looks possible and I am back. The temperature today is ~9oC, a mixture of sunshine and cloud with a light wind. 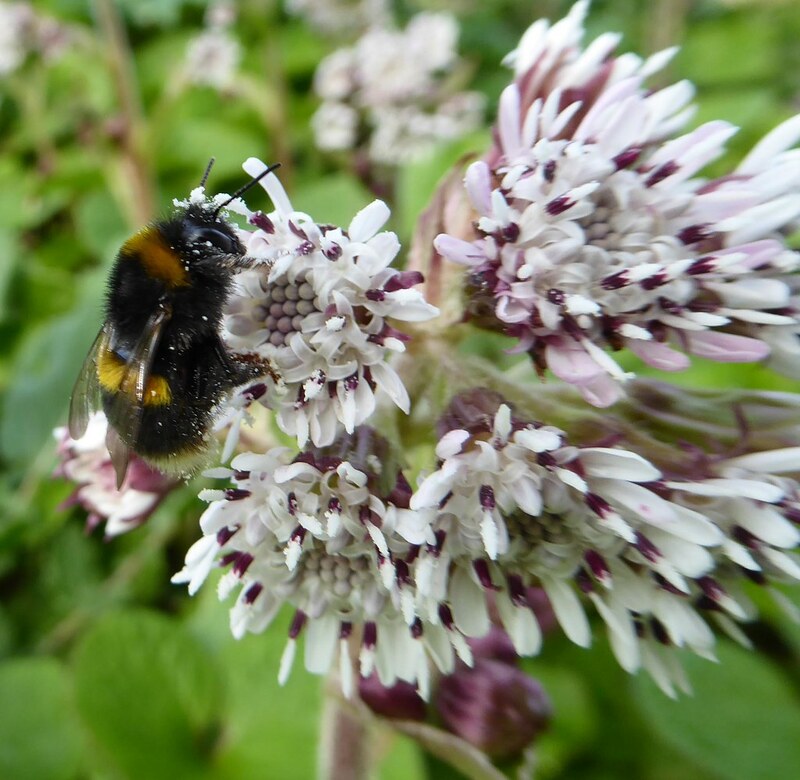 There was frost the night before in Totnes and, although it probably didn’t frost in Paignton, I wonder how the lower temperatures will have affected the bumblebees. In fact all seems to be well. 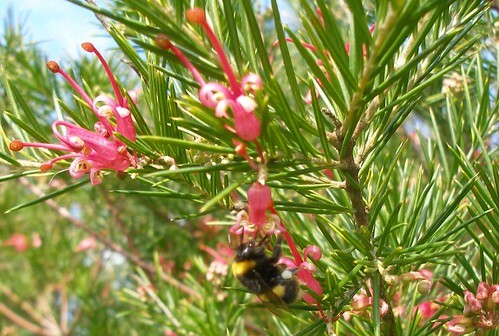 I see workers with pollen on the hanging rosemary, on the hebe and on a shrub covered with unusual spiral-shaped red flowers that I identify later as Grevillea, a native of Australia. Some of these workers fly at me as if to shoo me away; perhaps they feel threatened. 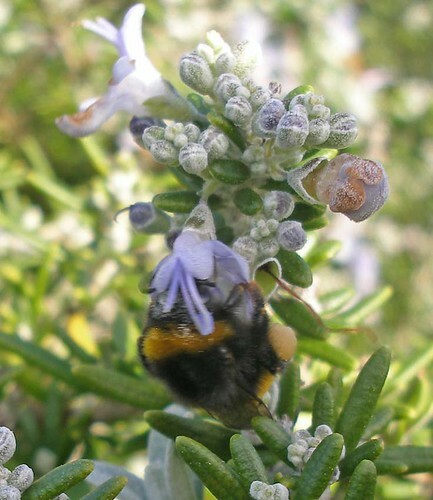 At the island border I see a worker and several queens feeding off the rosemary. 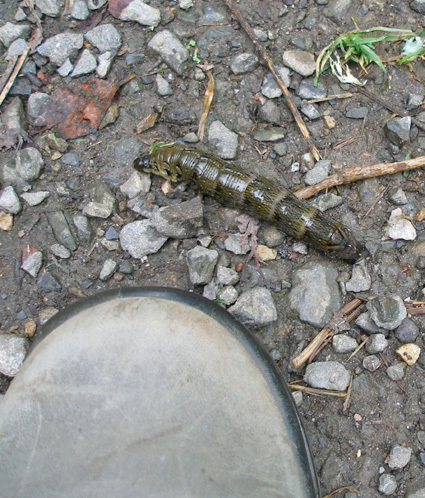 At one point, a queen flies to the ground where she wanders about apparently looking for something. 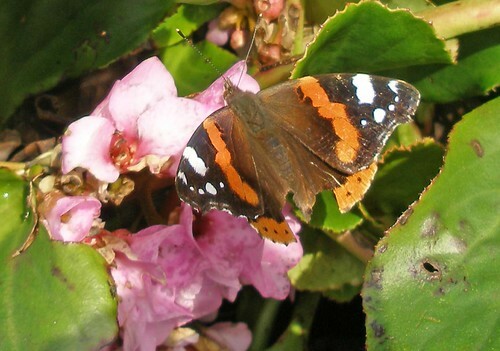 There are no bumblebees on the bergenia today but, astonishingly, I see a red admiral butterfly on this plant. I don’t think I learnt very much from this visit except that this is a very mild spot with plenty of bee forage even in midwinter. So, I decide to visit again just under two weeks later on another sunny day. In Totnes the air is very cold (~5oC) but, when I get to Roundham Head, the sun is shining directly on the Gardens, it feels quite warm and there is little or no wind. 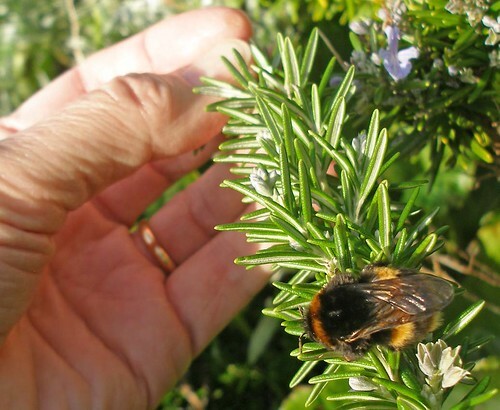 My experience today is different: I don’t make any definite sightings of queens but I do see several workers and with one exception these are all feeding on rosemary. The workers differ considerably in size but that’s a common observation. 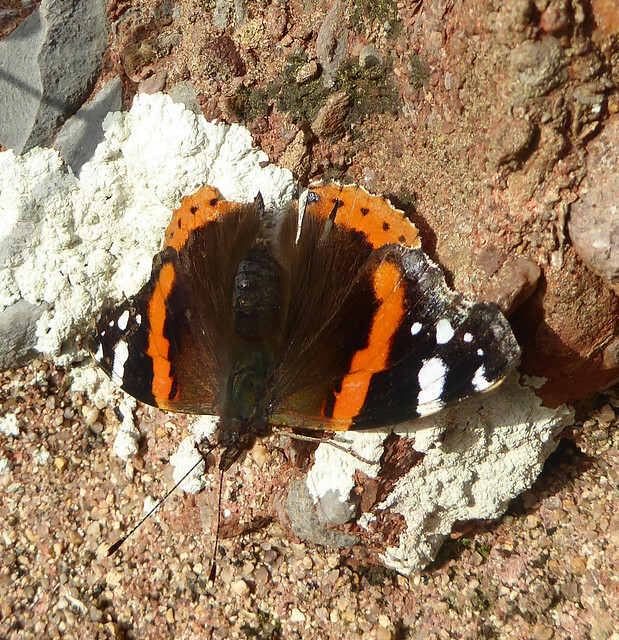 They all look in very good condition; their wings are not frayed so they are relatively young. 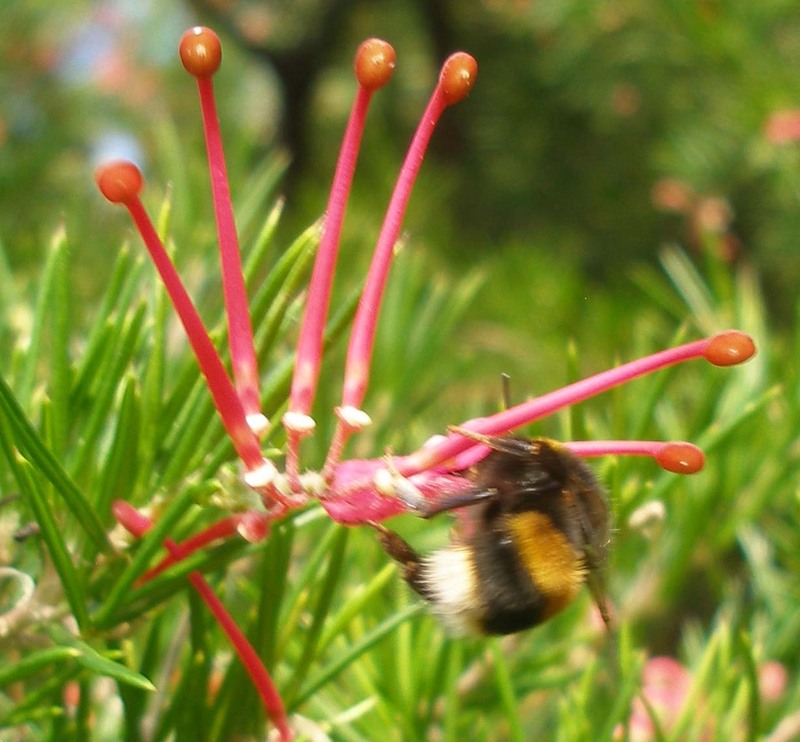 While I stand near the Grevillea, a large bee, probably a queen, flies at me, does a few circuits around my head and then flies off. I get the impression I am being warned but perhaps I am overreacting! 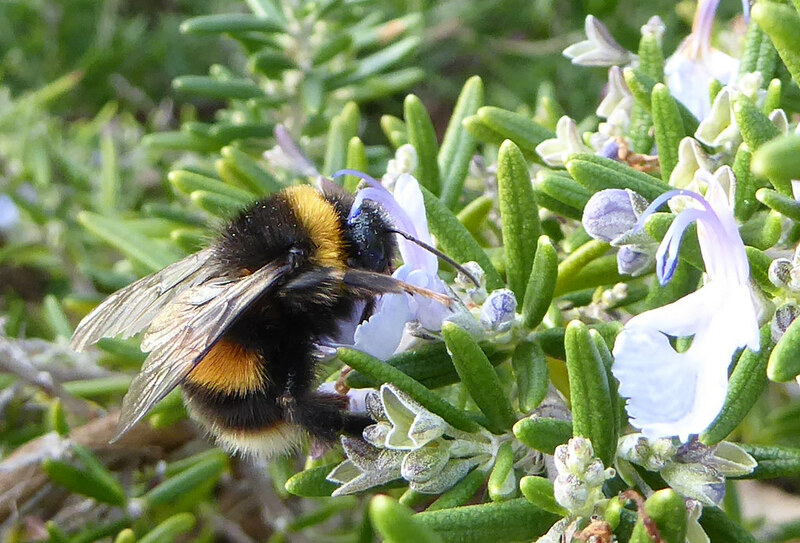 Bumblebee worker on rosemary (February 4th 2015) – note the brown band before the white tail (typical of B. terrestris). I am not sure where this one found the yellow pollen? Later, when I have a good look at the photos of the workers I notice that they have a narrow brown band just before the white tail. 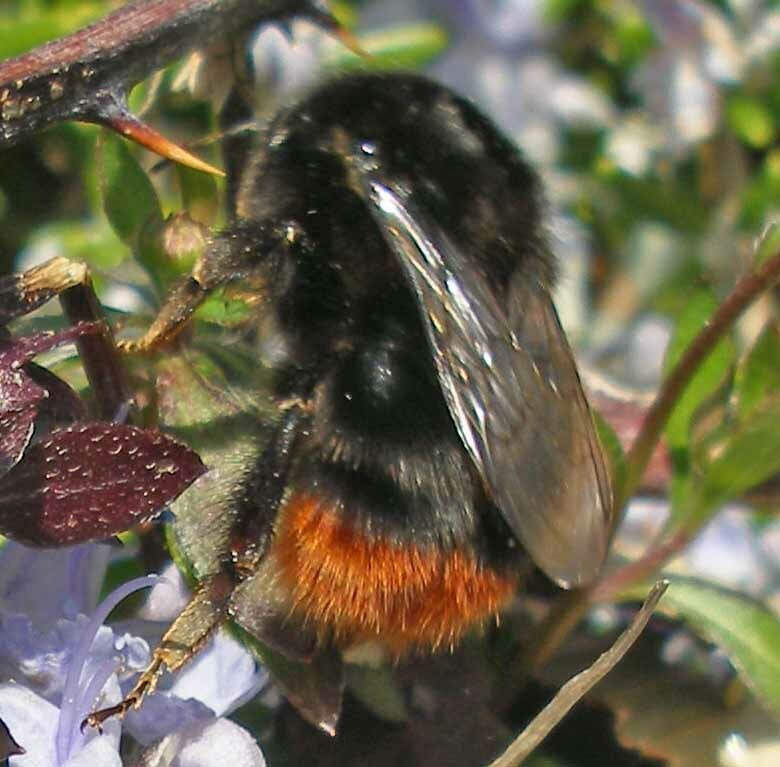 This is typical of buff-tailed bumblebees and is not seen on white-tailed workers so it is likely that the active nests are buff-tailed (Bombus terrestris). Over a period of about four weeks in the middle of winter, I have been able to see buff-tailed bumblebee queens and workers quite easily at this location. I get the impression, however, that there are actually not very many about: perhaps four queens and eight workers? 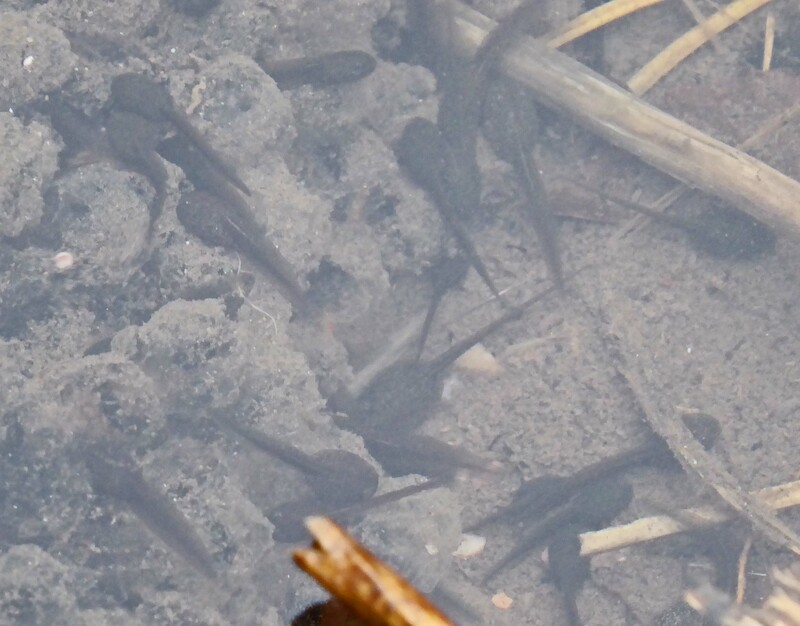 The presence of foraging workers as early as January 4th indicates an active nest. I have no idea about the site of the nest but I assume there is a queen, tending larvae and being fed by the workers. The nest was probably established in the last few months of 2014. 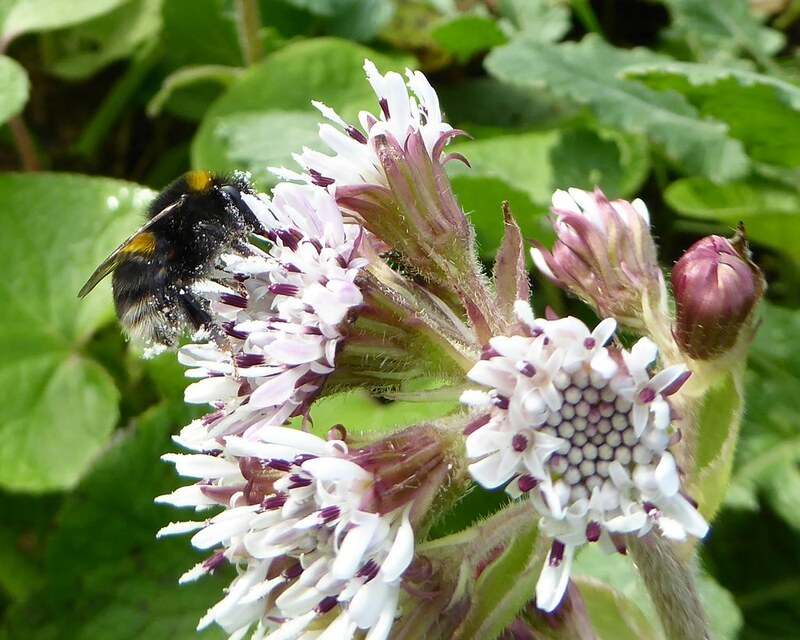 At this time of year, bumblebees typically hibernate but since the 1990s there have been reports of winter-active colonies of mainly buff-tailed bumblebees, largely confined to the southern part of the UK. Speculation has been rife as to what is causing this change in behaviour. 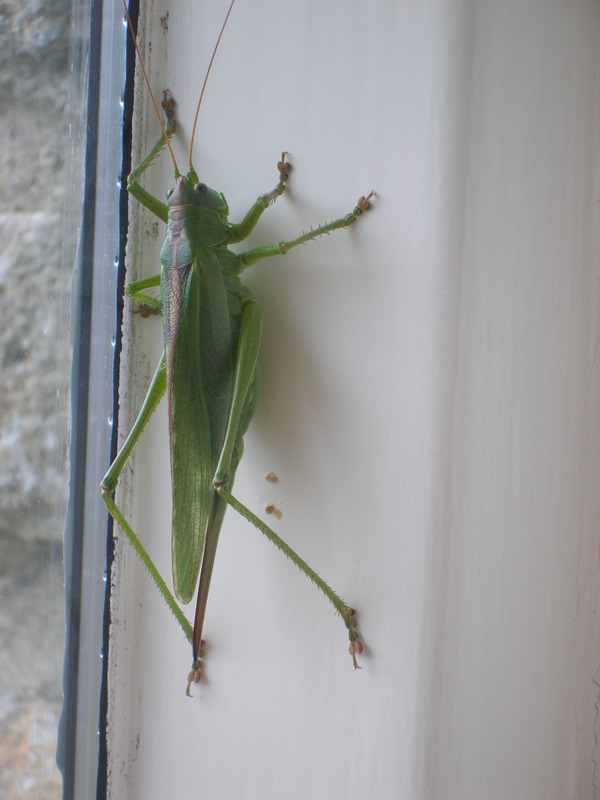 Some suggest it is linked to warmer winters associated with climate change. 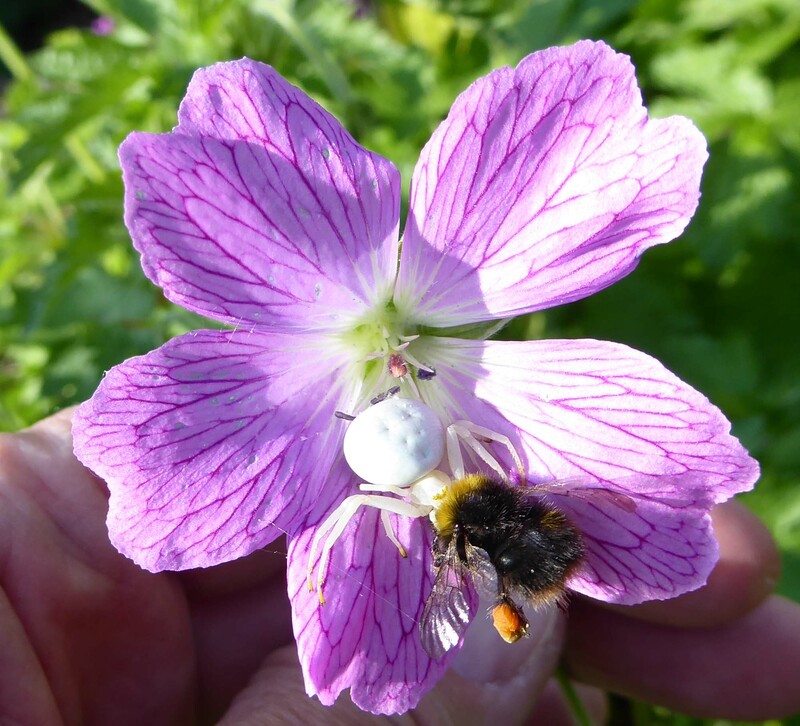 This can’t be the whole story as, according to Dave Goulson, bumblebees in Brittany do not exhibit the same winter activity. 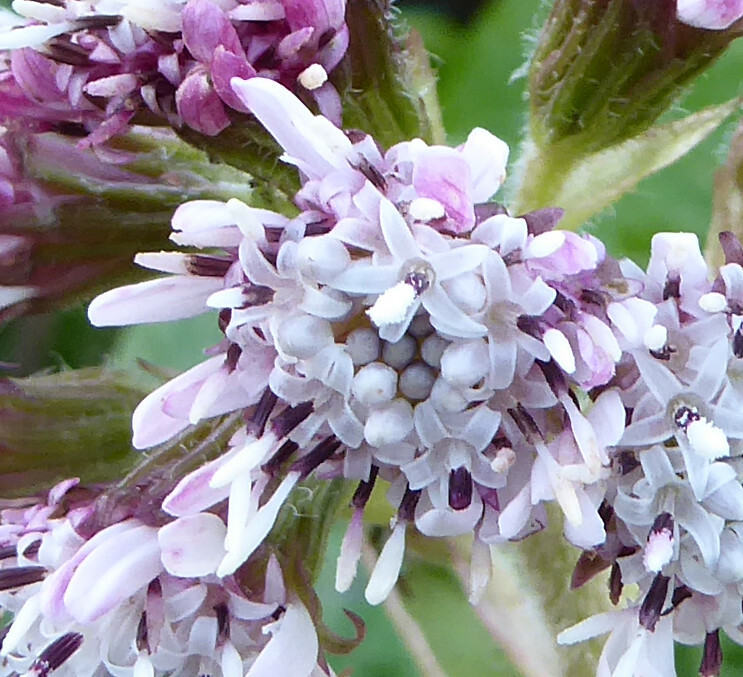 The magic ingredient may be the availability of winter forage in the UK linked to the British passion for gardening and planting winter-flowering shrubs. 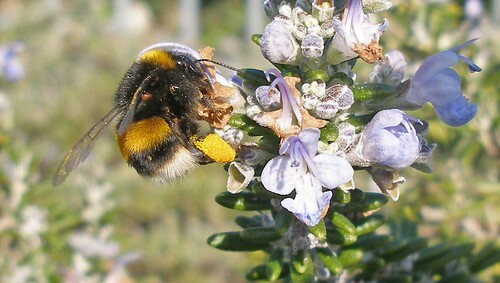 The sub species of Bombus terrestris found in some parts of continental Europe can also have two nesting periods a year, when climate is suitable and winter forage is available. 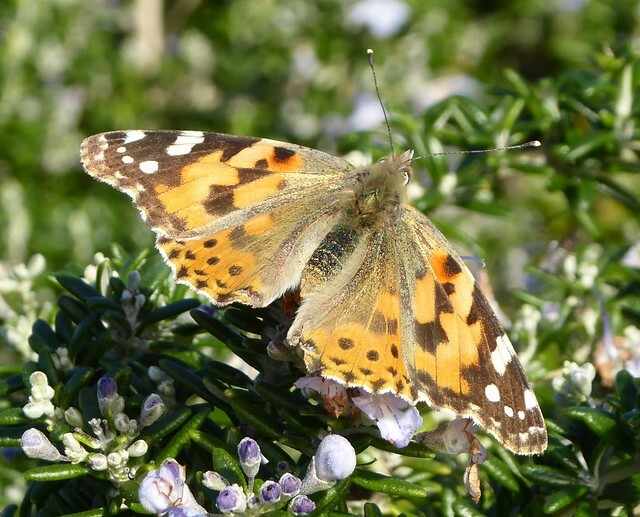 A litter is produced across spring and summer and fertilised queens find suitable places to hibernate for 2-3 months before emerging in late September to set up new colonies across the winter. The Roundham Head colonies probably arise from fertilised queens produced during summer 2014 who emerged after a few months rest to set up winter nests. The microclimate and the abundant local forage make this activity possible. 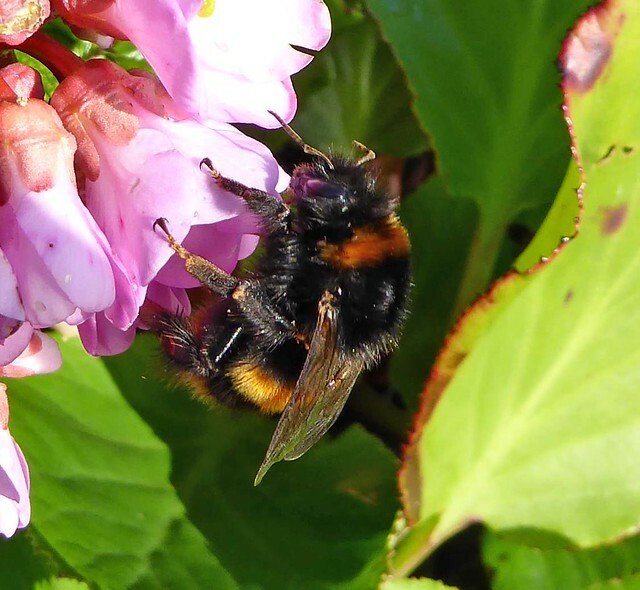 There has been speculation that the continental sub species of Bombus terrestris, imported for pollinating vegetable crops, may be escaping and establishing itself in the UK. 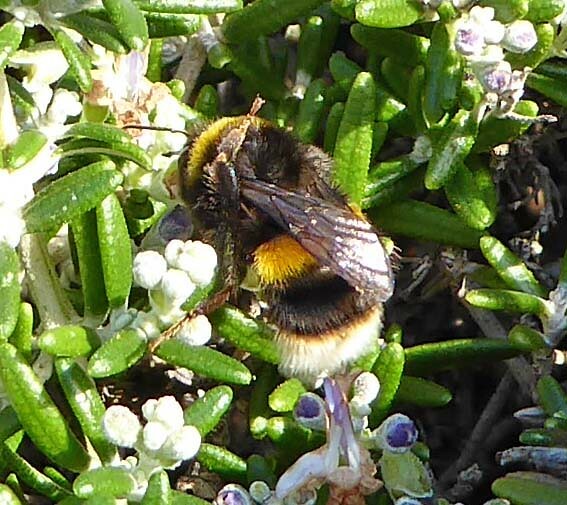 Given that this sub species sometimes produces two generations, it is possible that these continental bumblebees could be the winter-active bumblebees seen in the UK. 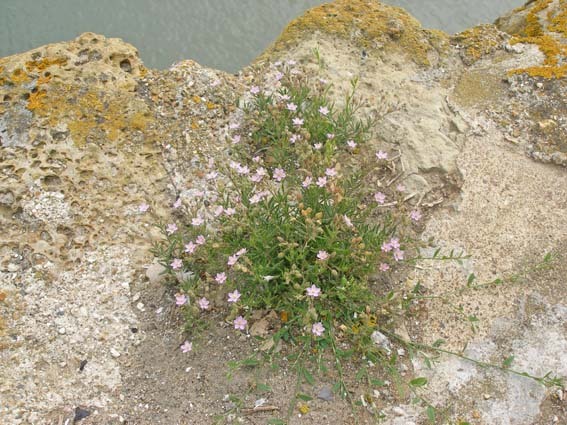 The Roundham Head colonies, however, have the physical characteristics of the British sub species so they cannot be foreign escapees. What about the queens that I saw? Here it all becomes rather uncertain. They could be founding queens from active autumn/winter 2014 nests coming out for a feed or they could be new queens generated by these nests. Alternatively, they could be queens from summer 2014 nests emerging from hibernation on a warm day. What might happen to these summer 2014 queens is also a bit unclear. They might set up new nests if the weather stays warm. Perhaps if the weather turns cold they return to hibernation after feeding but, it is not known if this actually occurs. 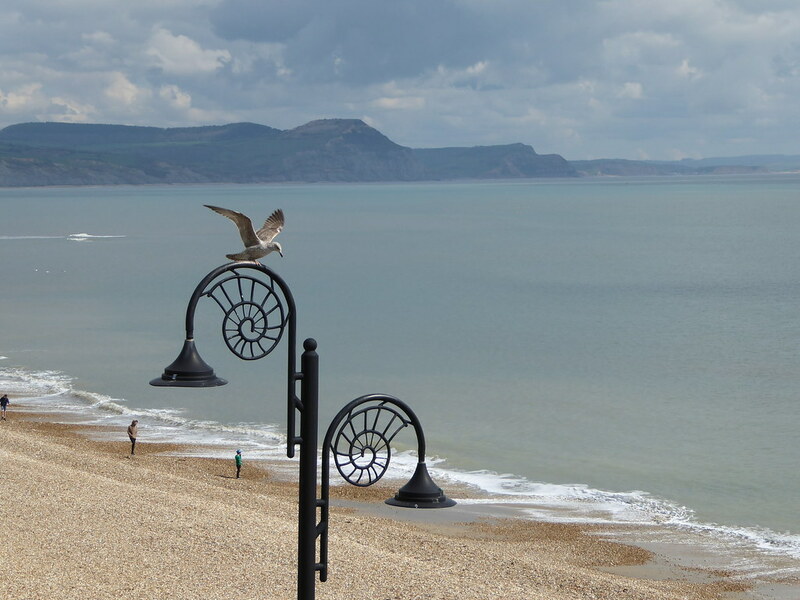 So, more questions than answers, but there definitely are active winter nests at this favourable seaside spot. It’s been fascinating and great fun to observe these bees and I shall continue watching over the next few months to see what else I can learn. I should like to thank Dave Goulson (University of Sussex) and Tom Ings (Anglia Ruskin University) for helpful comments.